Why are there so many camper vans on Palo Alto’s El Camino Real and on side streets in Mountain View? The RVs lining roads on the Peninsula are a hot topic. Complaints about them in Palo Alto and Mountain View have reached both city councils many times. The two cities are taking very different approaches to the issue that can be blamed on the housing crisis. Cost of housing. To afford a two-bedroom house in Santa Clara County, you would have to make at least $42.69 an hour. The median sale price of a home in Palo Alto is about $2.5 million, and the average rent is about $3,616 a month for a two-bedroom apartment. In Mountain View, the median sale price for a home is about $1.7 million, and rent averages around $3,400 for a two-bedroom apartment as well. It was recently discovered that some of the people living in RVs in Palo Alto are renting them for $400 to $500 a month. So, it makes sense why some people are living in RVs in Palo Alto and Mountain View. Housing policies. The high cost of living combined with the lack of affordable housing units has contributed to the RVs in Palo Alto and Mountain View. Both cities have struggled to produce affordable housing units for many reasons including an uproar over traffic congestion, parking concerns, zoning restrictions, costs, etc. None of the affordable housing units in Palo Alto have openings and only a few have wait-list spots available. Between 2015 and 2023, Palo Alto is supposed to build 1,988 affordable housing units and Mountain View needs to build 1,665 to meet state law. However, there are no consequences for the cities if this mandate isn’t met. Palo Alto, for example, only produced 18 units in 2016 and 89 in 2017. Palo Alto: In response to more and more community complaints, Palo Alto is tightening enforcement of the RVs on El Camino Real. Even though El Camino is a state-owned highway, the city of Palo Alto enforces parking rules on it, and vehicles cannot be parked in the same spot for 72 consecutive hours. RV dwellers circumvent the rule by driving around a little bit and then coming back to park or moving their vehicle down the street. Last year, the city warned people they could be towed; but only three RVs and trailers ended up getting towed. 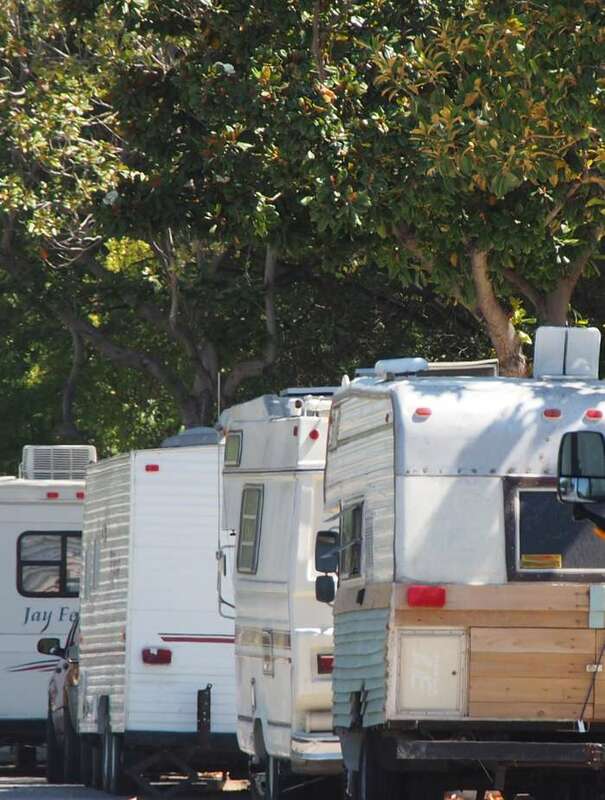 With sometimes over 100 RVs parked, enforcement can be difficult. Mountain View: Mountain View has launched a few programs to manage the 250-300 RVs on the streets, many of which are parked on Cristano Avenue. One of these programs is the Lots of Love Safe Parking Program that provides parking spots in St. Timothy’s Episcopal Church’s rear parking lot for people living in RVs, but as of August, only three families have parked there. The city tried to start a free waste collection program for those living in RVs but decided to end it due to low turnout. The low participation was due to a variety of reasons including inoperable vehicles unable to make it to the dumping sites and people’s inability to bring their RVs by during the scheduled times. Looking toward the future. Palo Alto’s Transportation and Planning Commission sent its recommendations to the City Council earlier in November to rewrite zoning laws that encourage more housing development including affordable housing. Mountain View approved a new housing project in January that would put 62 additional affordable apartments in Shorebreeze Apartments. This answer was produced by Pactio and journalist Ashlyn Rollins. Now, it’s time for you to ask your question. Incubated at Stanford University, Pactio reinvents the way local journalism is created by bringing together readers and journalists to discover and fund the stories they need and want to know about their community.